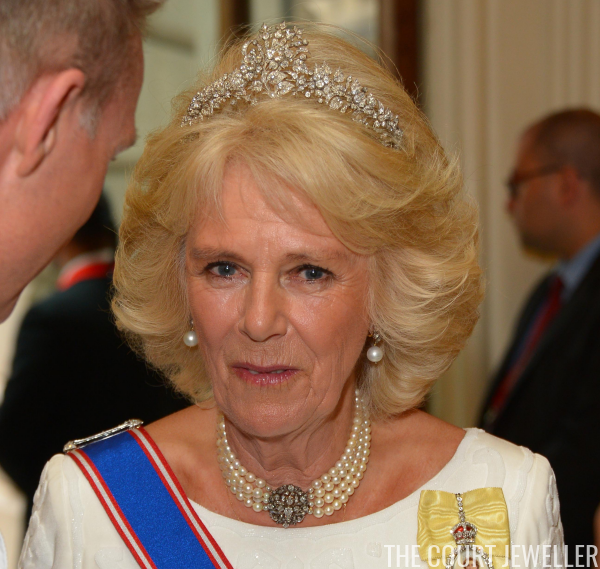 Since marrying into the British royal family in 2005, the Duchess of Cornwall has had a number of magnificent tiaras at her disposal, including the Greville Tiara and the tiara from the Delhi Durbar parure. Even so, Camilla still sometimes reaches for another sparkler: the tiara she inherited from her own family. Sonia lent her diamond tiara to Camilla for her 1973 wedding to Andrew Parker Bowles. You can see the tiara's distinctively tall center section above Camilla's hairstyle in pictures from the day. 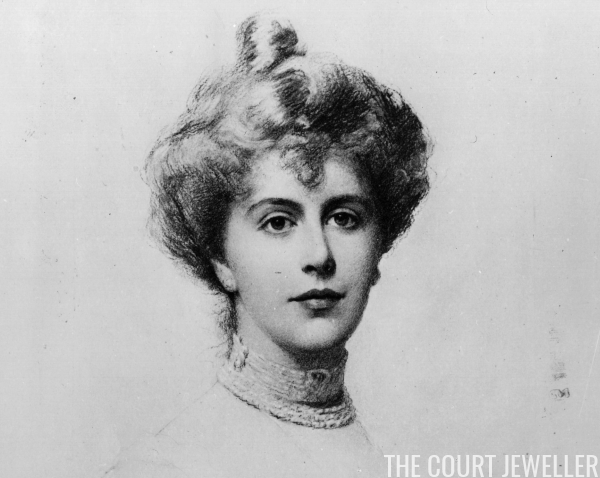 When Sonia died in 1986, the tiara was inherited by Camilla's mother, Rosalind. She married Major Bruce Shand, a WWII hero, in 1946. Rosalind chose to wear flowers instead of a tiara at her wedding. In fact, I haven't seen any photographs of Rosalind Shand wearing the tiara. 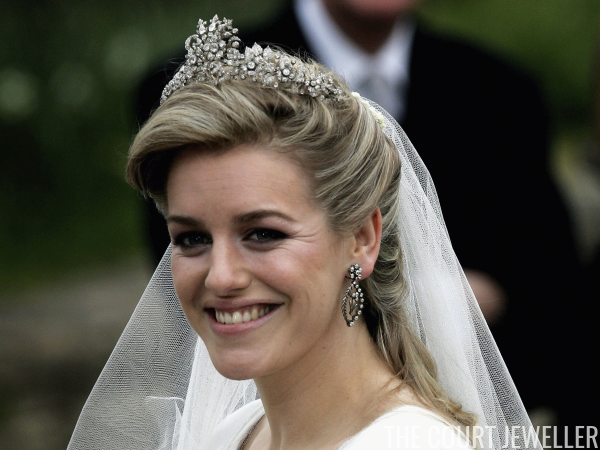 In 2006, though, Camilla's daughter, Laura, extended the bridal tiara tradition to another generation. Rosalind died in 1994, and she left the tiara to Camilla, who is the elder of her two daughters. After Camilla married Prince Charles in 2005, she wore the tiara to the annual diplomatic reception at Buckingham Palace. She wore the tiara again for the same event in 2014. 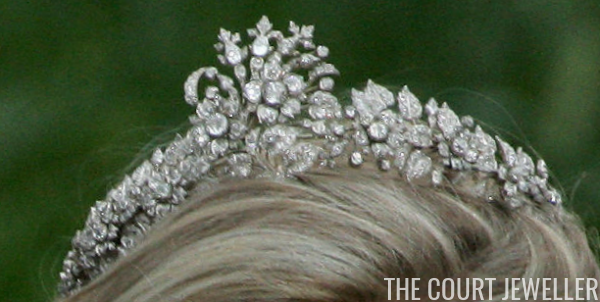 We also got a good look at the tiara at a dinner at the Royal Academy of the Arts in June 2015. 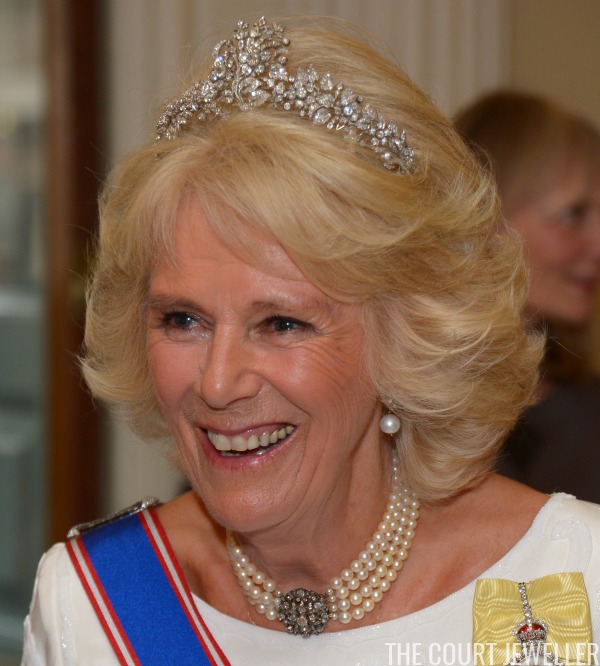 I can understand why Camilla has become so partial to the grand Greville Tiara over the past decade, but I also get why she'd want to pop on this smaller sparkler occasionally -- it's a bit easier to balance, I'd imagine!